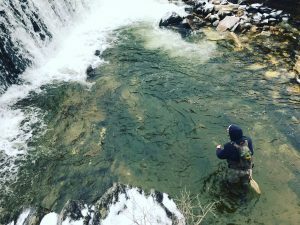 It’s officially Trout Season in Vermont! 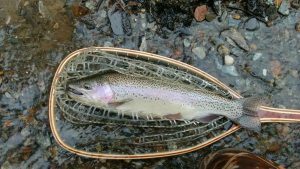 Hopefully you already have your Vt fishing license and got out over the weekend. If you did than you had to deal with high water, rain, wind, snow and a crazy ice storm. The rough weather and less than ideal river conditions makes it all that much better when it works out and you put a few in the net! 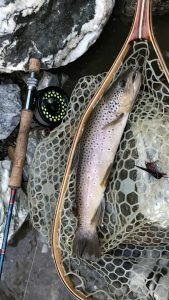 Guide Dave Durovich hit his favorite Winooski River tribs and was rewarded with a massive Bow and a foot long Brown on opening day. Look for more information on that river system soon. Dave said “Find water that’s not completely blown and fish the deep softer pockets with big bugs and streamers. Same spring technique’s as anywhere”. Water was 38 degrees where he was fishing. A bunch of us guides fished the 10th annual Otter Creek Classic as usual. 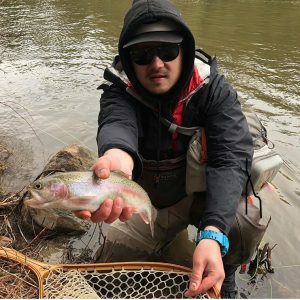 It’s put on by Green Mountain Adventures and benifits the New Haven River Anglers. This year the pro division had to fish barbless hooks and everyone was given a garbage bag. You got an extra 5 points if you filled it up. Nearly all the 120 competitors took part and we filled up Steve’s truck with trash. A great jump on Green Up Day which is May 5th. Here’s how some Stream and Brook guides fared in the OCCX. Andy landed a nice Bow and played a few others. Gerry spotted a very large Brown and crossed way above then returned and got it to eat a Nymph. He found himself in a tough spot playing it from a high bank in fast water and just couldn’t get it in the net. He was lying down fully reaching down when it came unbuttoned. John said he hooked 3 large trout less than 3’ from the bank on the Otter. Unfortunately none were landed. Nick said he didn’t land anything and I think he was slinging huge streamers most of the time. Sutton landed a big 18.5” Brown and also a 13”er on the first morning. He finished fourth in the pro division. He also won the Orvis Helios 3 engraved with OCCX in a raffle at the awards party at Rough Cut. I’ll post his fish pics when I get them. I ended up 5th in the pro division with a 13.5” Bow and a 12” Brown. I farmed several nice fish including 2 that were well over 20”. Bill Slyvester working a nice pool Sunday morning. GMA guide Devin Wendel repeated as champion. He joins myself and OCC founder Jesse Haller as two time champs. GMA Guide Levi Doria took second and Sam Orvis third. Along with the two day competition we had the Fly Fishing Film Tour and Green Mountain Project Healing Waters fundraiser in Middlebury. It was a super fun weekend filled with fishing, tellling fish stories with old friends, making new ones and not much sleep. Already looking forward to Otter Creek Classic 11! The Otter Creek is currently at 2,160 cfs in Middlebury. The clarity is decent and water temperature around 39. From Middlebury all the way South to Pittsford it’s flooded into swamps, forrest and fields. In some places as far as you can see. A normal thing this time of year for about a month. Don’t expect the Otter to dip below 1,500 cfs anytime soon. It’s actually very fun to canoe/kayak through the swamp and fields this time of year. Not fishing just kind of exploring with friends and family. All this water sitting out in the fields drops any sediment and is a few degrees warmer than the river without much current. It makes great spawning areas for Pike, Perch, Smallmouths, White Suckers, Bullhead and Fallfish. As it slowly drains back into the Creek all the fish enter back into the Otter. The Otter Creek tribs are high but fished well over the weekend. Rain on Thursday night, Friday night and snowmelt in the mountains had the New Haven River raging at around 1,000 cfs Saturday morning. It was closer to 200 cfs the week before and looked ideal. It dropped over the weekend but spiked again today as it’s currently 641. Super high but fishable. I hit one stretch today but didn’t hook anything. I switched to another OC trib and at dark caught a 17/18” Brown on a big White streamer. It was much lower and clearer than the NHR but just as windy. Across Vt today we had 20 to 50 mph gust mid day and still was brutal when I was fishing along with a cold driving rain every once in a while. To me this is big fish weather and was rewarded with a beauty. The big wild fish tend to be way more active in nasty weather conditions and in low light. Most of the times folks are not fishing. 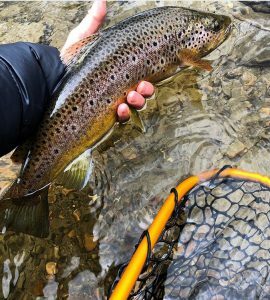 Greg Brown got this beauty a day or two before the trout season started in southern Vt.
Expect snow in the mountains and rain in the valleys throughout the week as night time temps are predicted to be in the 30’s. Be careful on the rivers as they are swift and maybe be a tad muddy. We are booking trips at a pretty good rate but have plenty of openings on the calendar. Give us a shout if you want to get out soon. 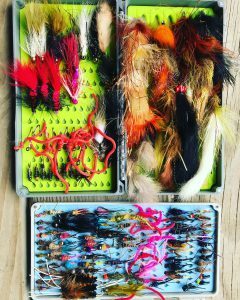 Look for a post about 20 must have flies for this time of year soon. Good day, I am interested in the southern Vermont mention. 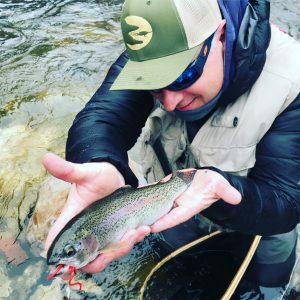 What rivers/tribs are you all fishing?